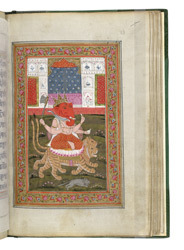 This is one of 12 miniatures from a manuscript of Hindu rituals and devotional tracts. The manuscript is written in the Sanskrit language, in Sarada script. It has 74 pages and was made in Kashmir during the 18th century. Find out more about this manuscript and other sacred texts in Expressions of Faith.